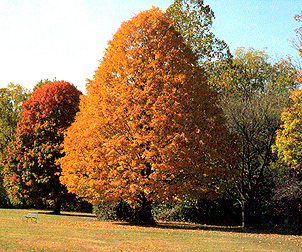 Acer saccharum or sugar maple is one of the best of the larger shade and lawn trees; excellent for lawn, park, golf course, possibly as street tree where tree lawns are extensive; beautiful fall color and pleasing growth habit. The sugar maple pictured shows its beautiful fall color. Prefers a well drained, moderately moist, fertile soil but shows a high tolerance to salt and alkali soils. Shipped bare root, one to two foot, seedlings.